The Harvey Northcott Memorial Fund Scholarship is given to worthy young recipients annually to support those youth who have demonstrated a commitment to their community and want to pursue post-secondary education in an agricultural-related discipline. The award was created to pay homage to one of the founding members of Leduc's Black Gold Professional Rodeo and to reflect Harvey Northcott's belief in the power of education to build a better world. This year featured three scholarship recipients; Morgan Chodzicki, Brydelle Wardley and Brody Tattrie. Morgan is a very special young lady with a drive to succeed. Her goal is to become a veterinarian to help the animals like the ones she has grown up with and loves so much. 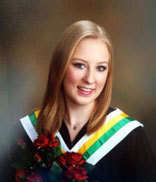 Morgan is an alumnus of Lacombe Composite High School where she was nominated as one of the "Leaders of Tomorrow" through the FCSS board in her community. She's also a member of her school's SADD (Students Against Drunk Driving) group and a barrel racer in the Alberta High School Rodeo Program. Here is more about Morgan in her own "write". "Being a rodeo kid who lives on a farm has made me no stranger to hard work," wrote Morgan. "When I was young, I decided that I wanted to put my skills of dedication and perseverance to good use by putting it towards school. My end goal has always been in mind as I've gone through schooling; I want to be a veterinarian. Now that I am graduating, I have been accepted to the University of Alberta, which is the first step towards my dream. After I become a vet, my goals are to specialize in performance horses and eventually open up my own clinic. By doing this, I will not only be doing what I love, but I will be able to help the rodeo world, which is a large part of me. I can't wait to see what the future holds for me, and I thank the Leduc Black Gold Rodeo Committee for helping me move one step closer towards my university goal." Another young woman who has made an indelible mark in her community despite her youth is Brydelle Wardley. Brydelle has been a much-loved coach and mentor at the Blackfalds Figure Skating Club as well as being actively involved in her local 4-H club, including volunteering for a position in that organization's executive board. Here is Brydelle talking about the scholarship and her future. "I have always been a rodeo fan and especially proud to be associated with, and also a participant of, 4H rodeo. I will be attending school at Olds College in the fall and have enrolled in the Agriculture Management program. 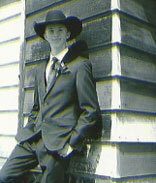 I would like to thank the Leduc Black Gold Rodeo Association for considering me for the scholarship." "Luckily, I had the good fortune to have known Harv and the Northcott family which makes it extra special to me to accept this scholarship and hopefully make Harv proud. I will continue to be involved in agriculture, rodeo, and giving back to my community. Through 4-H, our AG societies and our community's commitment to rodeo, volunteers have kept the sport alive and thriving. 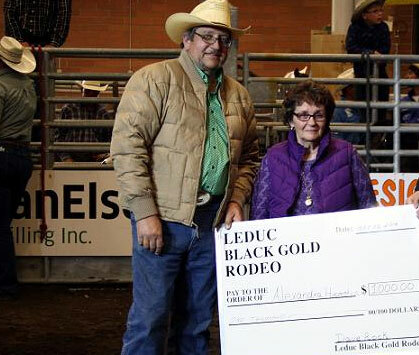 Accepting the Harvey Northcott Memorial Scholarship from the Leduc Black Gold Rodeo Association is truly an honor." Brody Tattrie is proud to be following in his father's bootsteps with his love of rodeo. Troy Tattrie is a former competitor in the Canadian Finals Rodeo and Brody has always loved the sport at which his father excelled. This is why he became involved with 4-H Rodeo as soon as he was able. Young Brody not only excelled at rodeo but also in Public Speaking through the 4-H Multi-club, coming in third in that event in 2014. Here is Brody discussing his future plans. "My name is Brody Tattrie. I am 18 years old and am from Youngstown, Alberta. I am currently attending my first year at Lakeland College. "I hope, after my two years at Lakeland College, to be able to move back to my hometown with my Diploma in Wildlife and Fisheries Conservation and possibly become an active working member of Ducks Unlimited Canada or a Fish and Wildlife Officer. I think this would be a great fit for me. I am very familiar in this area. I come from an agricultural background so I understand the needs of farmers." "As well, I am a motivated and passionate individual looking to make a difference in the natural environment. Being able to return to my hometown and make a difference that everyone can appreciate is very important to me. I always enjoyed living and working in rural Alberta. 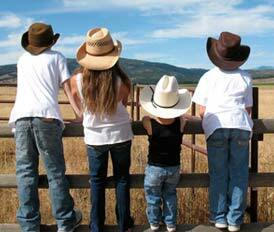 I live in the Special Areas; an area economically driven by the ranching community. I hope to put my diploma to use, as well, in starting my own ranch." "I am currently a member of the Canadian Intercollegiate Rodeo Association and this summer I will be riding bulls in the Foothills Cowboys Association as well as the Chinook Rodeo Association. Two of my younger brothers also steer riders, one of which is a Canadian Finals Rodeo Qualifier. I have been very privileged to get to mentor my brothers and help them achieve their goals." 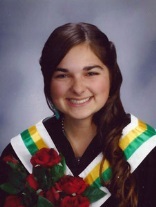 "I am honoured to be recognized as one of the Harvey Northcott memorial Scholarship recipients." As always, the scholarship selection committee was impressed with all the submissions they received from youngsters in our region. It demonstrates the passing of the torch to the next generation of qualities such as perseverance, love of nature, hard work and kindness. The Black Gold Rodeo Association salutes all those young people who are making a difference in their communities including, and especially, those that have earned the 2016 Harvey Northcott Memorial Scholarship; Morgan, Brydelle and Brody. We wish them great success in their future and hope the scholarship helps them bring their ambitious plans to fruition.